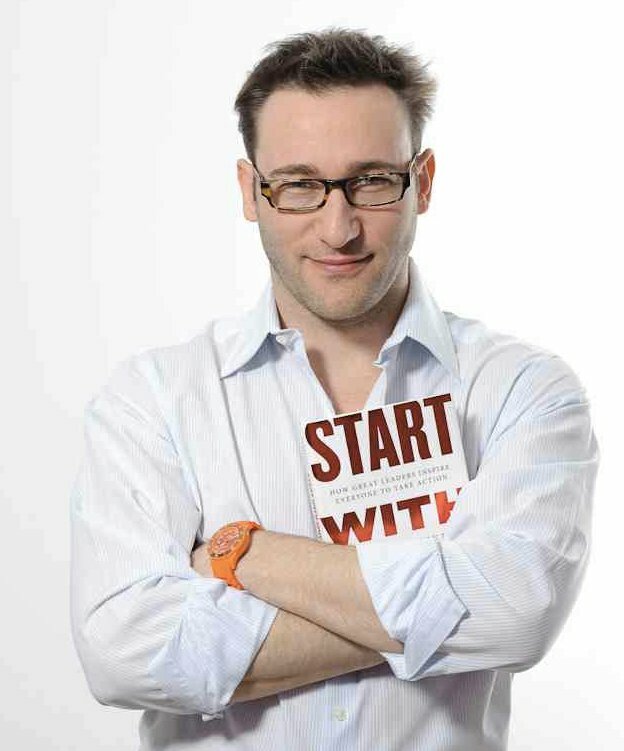 Thank you Simon Sinek for being our guest webinar interviewee. We’d like to pose a few questions for YOU so that you can make tonight’s leadership interview with Simon actionable. Go ahead and choose any or all of the questions here and write your response in the comments section below. (This is not a contest, but I did pick up an extra copy of Simon’s book. I’d really like to see some thoughtful responses and randomly choose a person to mail Start With Why to). As an attraction marketer, you have to give people a reason to follow you. It begins with your Why. If you don’t have Clarity of WHY, the Discipline of HOW and Consistency of WHAT your marketing is likely going to be one big blurry message to your prospects. The more clear you are on your Why, the more people will be attracted to you because of shared values. We’re “social animals,” and we look to where we can feel safe. We join and congregate together around those shared values. Don’t try to define your Why just yet. Instead, identify the words, phrases, and general themes that surface when you think about your Why. What are the recurring words and phrases surrounding your Why? Can you start working on a Why statement? Let’s get started on that now. Your Why statement will have two parts –the purpose or belief behind what you do AND what that purpose or belief is going to accomplish. Fill in the blanks: Everything I do is to __________ so that __________. Do you see yourself as more of a visionary and leader? Or do you see yourself as more of a How (a systems person)? What collaborative relationships can you form as a result? What other thoughts do you have about your Why? Ask your questions, leave your comments or simply give thanks to Simon in the comments area below. Ann Sieg is the CEO of 80/20 Marketing, Inc. She's the author of The Renegade Network Marketer, The 7 Great Lies of Network Marketing & The Attraction Marketer's Manifesto. I'm inviting you to connect with me. I love feedback. All of it. So let's have an intelligent helpful conversation to help you become more profitable in your business. Leave a comment below. Simon & Ann, wonderful webinar. Like the comparison contrast on the ‘why’ and ‘how’ personalities as well as how they can compliment each other and bring success. Always told that partnerships were something to stay away from and can relate you your personal experience Simon. As Ann stated a few times there needs to be a paradigm shift and I believe you may have triggered that tonight for myself and many others. Look forward to more material from you and a read through your book. Thanks! Thanks for attending our call. Simon is quite the inspiration and professional. Really pleased to have him as one of my presenters. Be sure to grab a copy of the book. It’s on page 143 where he talks about the role of a “Why” person and a “How” person in business and how they often come from within families IE Roy and Walt Disney. They each need each other and the visionary especially needs the “how” person. And yet he made the additional distinction that every one in any role needs to have their why. I really enjoyed listening to both of you! I like the shift of a strong enough why to be able to sell, sell, sell, to being to being a part of a relationship and how I can help others. I really feel the need to community, as I am a stay at home mom of almost 2 y/o twin boys and an almost 5y/o daughter, so I don’t get out much except to do my business, which isn’t often enough as I have a hard time booking parties! Hubby just got laid off, so now we are just down to my business, which barely makes enough to stay in business! I am looking for lots of info to help us move forward and I think this can help! I loved “the one bad day is just one bad day!” Learn and move forward! Really hit w/ me! Thanks! So glad you enjoyed the webinar. Oh my, so you are now essentially the primary bread winner for your family. I have to admit that was some what my situation as my husband’s windshield business fell apart due to legislation. I had to get in there and build like crazy to replace his income. I’m sure you and your hubby will have the strength of teamwork to pull your resources and talents together to figure things out. That’s in essence what we did. Thanks for stopping by Tonya. What a fantastic webinar! Not only is Simon’s articulation of words so clear (I just love to hear him speak), his message is so meaningful. He talks about the personality of people with a ‘Why’ mentality and those with a ‘How’ mentality and just what the two should do to help each other. He talks about the difference between loyalty and trust, about partnering, about the basic human desire of people..and so much more! And he says it all with such calm and clarity. Thank you, Ann, for inviting me to listen to such a thought-provoking speaker. Can’t wait for the next one! You’re very welcome. Glad you enjoyed the webinar. I agree. The whole partnering up a “Why” person with a “How” person makes sense. Both need each other but the Visionary most definitely needs the “How” person. I got the impression from Simon a group of “Hows” can do pretty well on their own and get moderate results. Get them behind a visionary and look out! Thanks for stopping by Joyce. Thank you so much for the wonderful webinar this evening. Eric, thank you for the amazing introductions. My mind is very busy right now as I sort through all of this. At the risk of making myself vulnerable, I must open up a bit, and share from my heart. I see myself more as a visionary and leader. I get ideas nearly everyday. some are great ideas, others not so great. When it comes to nuts and bolts, and how things work… I “suffer” through those things in order to realize my ‘idea’ or dream. Yes, I can do the “how”, but it usually is in order to see the bigger picture come to pass. Now, concerning the words surrounding my why. I jotted down some words like: Inspire, Empower, Mobilize, Equip, Teach, Help, Train, and Motivate… Each of those words are dear to me. We moved to Thailand for the purpose of Glorifying God, Strengthening Believers, and Leading souls to Christ. That is our basis for life, and the core of our beliefs. The reason I got into business online, is: 1. for the purpose of earning our own bread so that we are not dependent upon others. 2. To model to our neighbors, and other missionaries, that I also know how to work, and do business. 3. Because I love it. I love visualizing and creating a product or service that will help others be who they are meant to be. So, through it all, the things that bring fulfillment to me are: Inspiring, Motivating, and Equipping others to fulfill their callings in life. So, therefore what I do in business, is Teach, Train, and Equip others, to effectively market their businesses online using 21st Century technology, and Attraction Marketing principles. I love it. Since I am a visionary, it is very hard to be organized and see a project through to completion. Therefore I can totally see and understand the need for a collaborative effort with someone that can help put the systems in place. What I am thinking through right now, is how to narrow all of that down into a tangible, articulatible statement that will help others clearly know who I am and why I do what I do? I so appreciate this webinar, and all that you are doing for us in this Leader’s Circle. You are one of the most heart filled people I know. We’ve never met and yet I feel like I really know and understand you at a personal level. Yes, this was a candid explanation of where you’re at and it makes total 100% sense. I think you’re spot on that right now you need to take all of this vision you have and super compact it down until it turns into a fire ball. You’ll know it when you find it. Be keenly aware of how others pronounce their why. Some are definitely better at doing that than others. What I am most impressed about Simon is the singularity of focus his message projects. It’s crystal clear. It’s not one bit fussy and it’s filled with massive import. He definitely wants to change the world and makes it very clear how he’s going to do it. I think you’ve just been given great insight into exactly what you need to do. And I know you will find it. When you do Martin you be sure to let me know. I’ll be all ears. I am so sorry I could not attend the webinar. I was about to register, when I found out it would be held at 3 AM in my time zone. A great pity. It would be cool if there could be a rerun at a more convenient time. Anyway, I have read a lot of the material about the idea of “Start with Why” and it sounds very inspiring. I am working on an advertisement for my company right now, and I feel I could use this idea to write an ad that stands out. But thinking of my “Why” I ran into the problem, that my Why may not be the real motivator for my potential clients. My own Why is, I want to “provide a quality product” and “establish a long-lasting relationship with my clients”. I do that in my own company, because I have learned the hard way that most companies “just want to ship ASAP” and “don’t care about the future”, because they think they will always find another fool who will try their product. Yes, a rather negative view, based on 23 years of experience. It does not sound motivating. When I think of my clients (I work mainly as a translator), I can say they “want to convey a message”. So in my view, my ad could start with “You want to convey a message”. Not MY Why, but THEIR Why. Wouldn’t that be a much more clear message, something that would work a lot better to make them read all the 300 words in my ad? Thank you for reading these 265 words! So definitely you should focus on why that company does what it does. And it could be they don’t know. Much like Simon explained in his book. Most companies know “how” and “what” but not “why”. It takes the founder and visionary of the company to create and convey “the why”. Simon’s business case is that the better you know your why the better you can attract people. Like a big megaphone. From what you’re describing it sounds like you’re talking about the headline of your ad. The headline should be what grabs their attention. It should be extremely benefit driven. Question becomes will focusing on “The Why” of your company (the one you’re advertising for) be a good headline? I don’t know enough about it to know if that is going to get your prospect’s attention. “If you don’t have Clarity of WHY, the Discipline of HOW and Consistency of WHAT your marketing is likely going to be one big blurry message to your prospects.” A power statement that is fantastic! Great post on a topic that is one of my favorites. My spin – “Is Your Why Bigger than Your But” It must be at the core of all you do or you will fail brilliantly. Ok, so if you don’t fail, you surely will spin in a lot of circles toward overwhelm and exhaustion. I thought I’d give it a try with answering your questions even though I didn’t get in on the webinar (just found your blog). And I haven’t yet put my ‘why’ in sentence form. So great place to start. The recurring words and phrases surrounding my Why? Fill in the blanks: Everything I do is to transform mindset and limiting beliefs so that others can live from a place of authentic personal power. Do you see yourself as more of a visionary and leader? Or do you see yourself as more of a How (a systems person)? That’s a great question. I see myself as a ‘both and’ I am a visionary as a catalyst for transformation and a how to make it happen systems person. Calling people forward to step into their own power and communicate their value, vision, desire and need falls into that ‘both and’ relationship. What collaborative relationships can you form as a result? There are many, I live my days in collaboration with others because I know that the tide raises all ships in the harbor. To take my heart for transforming mindset and limiting beliefs and connect it with another persons ability to set vision of what that may look like, is a beautiful thing. My why is my flagpole of decision making. I use it to run all my opportunities by – if something I am presented with does not support my why or my why does not enhance the opportunity, it’s an easy no. If through my process and checking in with self I see that my Why is being honored and utilized to it’s full potential then I am at yes. Thank you for the exercise! And if you have the link to the recording of the webinar, I’d be happy to sign up for it. Thanks for stopping by and for your comments. Awesome! Love how clear your WHY is. It helps create a stress free environment for yourself. So many people are tossed to and free like the wind because they don’t have utmost clarity on who they are and why they are here. When that’s well in place you become a super magnet for people who share your values. It’s like an unseen energy but strongly felt by others of like-mind. From there everything becomes far more enjoyable and stress free. In the webinar Simon and I talked about today’s stressors. Stressors to be a “seller” and stressors to be a consumer. Those are essentially eliminated when you’ve got your why squarely in place. People have to line up with you and your vision and not the other way around. We don’t have the recording available at this time. We’re considering some time out to make our entire Leaders’ Circle series available to people. We’ve gotten tons of great responses from our current members. To answer your question it’s all about setting up systems and schedules. When you do that it makes “the load” that much easier. If you’re already journaling on a regular basis that’s half the battle. So you should be ready to get going right away. I will say beyond that if you want to build a following that leads into a sales funnel that’s something completely different than just journaling via a blog. If you are wanting to do blogging for marketing I strongly recommend you join my Daily Marketing Coach where you’ll receive training and guidance on how to do that. Here’s the link to learn more. You’ve Fallen Out Of Love With Facebook… Now What? Copyright © 2019 Ann Sieg Consulting, Inc. All rights reserved. Ann Sieg® and The Renegade Network Marketer® are registered trademarks of Ann Sieg Consulting, Inc.